PVC E-Liquids | White Mist Co.
What meal is complete without something sweet for dessert? 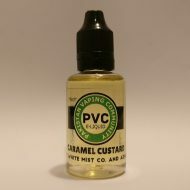 Caramel Custard eliquid, is all that and much more! Pakistan Vaping Community E-liquid (PVC E-liquid) is a collaborative project between the owner of Pakistan Vaping Community (Adnan S. Khan) and White Mist Co. The flavors have been developed with input from PVC members and crafted to perfection. Gamma Guava eliquid is a combination of fresh guavas with undertones of strawberries and pineapples. If you’re looking for a new fruity all day vape, look no further. Gold Tobacco eliquid is a medium body smokey tobacco with a nutty undertone. A treat for MTL vapers looking for a nice throat hit. Beat the summer heat with Lemon Blizzard E-liquid. You’ll love the citrusy lemonade, with a splash of mint and the kick of a chilled soda. Streak Breeze eliquid is heavy on the strawberry and light on kiwi, if you’re looking for a sweet and tangy sub ohm flavor you can’t go wrong with Streak Breeze, enjoy a chilled combination of strawberries and kiwi in the Pakistani summers.